TCU quarterback Trevone Boykin, right, celebrates a TCU touchdown against Mississippi during the Peach Bowl on Dec. 31 in Atlanta. It has sometimes been stated — I’ve said it myself — that a four-team playoff is inherently flawed when there are five major conferences. The truth is a little more complicated than that. Sometimes a “Power 5” conference champion won’t have much of a beef with having been excluded from the playoff. In 2012, for instance, Wisconsin was the BCS representative as the Big Ten champion despite just a 4-4 conference record (and an 8-5 record overall). It was a wacky case — Ohio State and Penn State finished ahead of the Badgers but were ineligible for postseason play — but it’s not so uncommon to have an “ugly duckling” major conference champion. Sometimes there will be an undefeated team from a “minor” conference, like Boise State. Sometimes independent Notre Dame or BYU will be undefeated or will have one loss against a strong schedule. Sometimes a second team from a power conference will have a powerful argument for being among the top four nationally. In 2011, for example, Alabama ranked No. 2 and was chosen for the BCS title game; its only loss had come against No. 1 LSU. In other words, this year wasn’t an outlier: A four-team playoff is liable to produce similar controversies more often than not. It may not be the particular controversy we had this year. But there’s liable to be some type of controversy. This is usually the point at which someone asserts the problem is infinitely regressive. 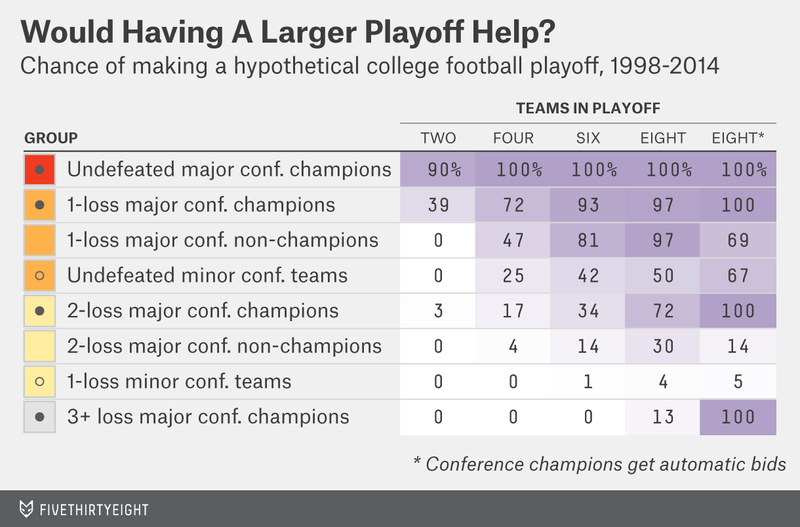 With four teams in the playoff, there will always be an argument over Nos. 4 and 5. With six teams, there might be the a debate over Nos. 6 and 7. Or with 68 teams, you’ll have a fight over Nos. 68 and 69. I don’t find this case entirely convincing; you’re going to hit the point of diminishing returns eventually. In 2012, I participated in a mock NCAA basketball selection committee for media members. When filling out the last few slots in the 68-team bracket, we were presented with some incredibly unappealing options: For example, a team that went 1-6 against top 50 opponents against another that had a losing record in conference play. Neither team had a snowball’s chance in hell of becoming national champion. What you don’t want to do is exclude teams that can make a credible case for being the best team in the country. It’s hard to put this philosophy into practice, of course. In a perfect world, you could permit a flexible number of teams into the playoff. One year, a team might be so far ahead of the pack that you’d be tempted to crown it national champion and cancel the playoff. The next year, the top group might run a dozen teams deep. Unfortunately, the NCAA and our corporate overlords ESPN aren’t likely to tolerate that sort of uncertainty when they need to set schedules months or years in advance. The second tier includes one-loss teams from major conferences, along with undefeated teams from minor conferences. The third tier consists of two-loss teams from “Power 5” conferences and one-loss teams from other conferences. The fourth tier includes everyone else. The former BCS system, with its national championship game, seemed to be based on the hope that there would be exactly two top-tier teams. Unfortunately that almost never worked out. Only four times in the 16 years of the BCS were there exactly two major-conference undefeateds. The years in which there were three such teams, like 2004, were especially controversial. The more common problem, however, is that there was often just one of these teams or none at all. So reaching into the second tier is a necessary evil if you’re going to have any type of playoff. That being the case, I’d argue that you’d rather not have to make extremely fine distinctions within the second tier. Perhaps you’re OK omitting some one-loss teams with gross deficiencies on their resumes (like those that both played poor schedules and failed to win their conference titles). But you’d rather not have to distinguish the Baylors of the world from the Ohio States. The problem with a four-team playoff is that it will often require the committee to make exactly those distinctions, splitting the second tier right down the middle. Let’s look at some historical data. In the chart below, I’ve listed the teams since 1998 as they were ranked in the final AP poll before bowl participants were chosen. (This serves as a good proxy for how the playoff selection committee might have ranked the teams. )3 The teams are color-coded based on which tier they belonged to. As you can see, these tiers do a reasonable job of reflecting how poll voters think about the teams. Sometimes the tiers get mixed up around the margins, but these are usually relatively obvious cases involving teams with especially strong or weak schedules. But you can also see the problem. In an average year, there are one or two first-tier teams and four or five second-tier teams. A four-team playoff will wind up splitting the second-tier teams right down the middle. What if you’re willing to omit one-loss teams that didn’t win their conference championships? 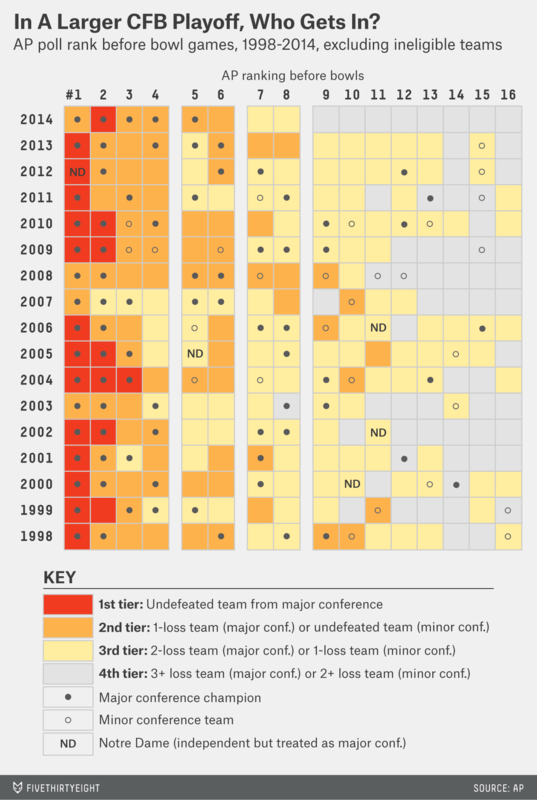 In the chart, I’ve also indicated whether a team won its conference title. (I’ve listed just one champion per major conference — the team deemed as the conference champion by the BCS in the event of ties.4 There’s special handling for teams from the former Big East conference, which no longer exists for football.5) This gets you closer, but you’ll still run out of space fairly often unless you’re also willing to kick out undefeated teams from minor conferences. What if we expand the playoff to six teams instead? Now we’re able to accommodate the clear majority of the second tier. One-loss major conference champions will just about always make it. One-loss non-champions from major conferences will make it about 80 percent of the time. Undefeated teams from minor conferences still struggle a bit, but overall this seems to strike a good balance. As a major conference team with just one loss, you’ll make the playoff unless there’s a lot working against you. With two losses, you’ll won’t make it unless you have a lot working for you. There are still some tough decisions to be made, but the committee won’t have to cleave the second tier in half, as it often will under a four-team playoff. If you expand the playoff to eight teams, you’re able to accommodate almost all of the second tier. However, about 75 percent of the additional teams you’d add with the seventh and eighth slots are from the third tier instead. This may be too tolerant, placing too little pressure on teams to perform and schedule well in the regular season. An alternative would be to include eight teams, but with automatic bids for major conference champions. (Technically you could do this under a six-team playoff, too, but it might not be advisable.6) Presumably, teams from outside of the power conferences would object to this, but you could accommodate them by guaranteeing a sixth slot to the best independent or minor conference team. That would leave two at-large positions. I’ve run the numbers on how this would work out — and it seems like another good option. By definition, we’re now including every major conference champion. While you’d have the occasional fluke conference champ like the 2012 Wisconsin team, that might be an acceptable price for reducing the subjectivity in the process. Non-champion teams from major conferences would sometimes make the playoff but would have a lot of pressure to schedule well and perform well. The majority of one-loss teams from major conferences would make it, but they’d be at risk if they fail to win their conferences. And taking a second loss would knock a team out the vast majority of the time. No system is going to end the debates; people still argue about which teams ought to be No. 12 seeds in the NCAA hoops tourney so they can lose to Kentucky in the Sweet 16. But expanding the football playoff to six teams — or to eight teams with some automatic bids — would do a better job of rewarding the most deserving teams while preserving the importance of the regular season. It would help to ensure the most important decisions of the college football season happen on the field and not in a conference room. The argument is particularly strong for TCU, which, after being leapfrogged in an unprecedented way in the committee’s final standings, went on to crush Mississippi 42-3 in the Peach Bowl. In fact, the Horned Frogs entered Monday with nearly the same Football Power Index rating (23.6) that Ohio State had (23.8). In the chart after this first bullet point, we’ve treated Notre Dame as a major conference team. You could use the BCS standings or the Coaches Poll as the reference point instead; they would lead you to pretty much the same conclusions. In 2014, the BCS was no longer active. I consider Baylor to have been the Big 12 champion over TCU by virtue of its head-to-head victory against them. Big East teams are classified based on the conference they belong to currently. If a former Big East team ranked higher than the top team from the conference it now belongs to, it is considered the champion of its current conference. For instance, Miami is classified as the 2002 ACC champion, because it ranked ahead of the actual ACC champion that year, Florida State. It provides for too little flexibility. What happens when in addition to the five major conference champions, there’s an excellent Notre Dame team and an undefeated Boise State? And by placing so much emphasis on the conference championship game, this system would serve to make the rest of a team’s schedule all but irrelevant.